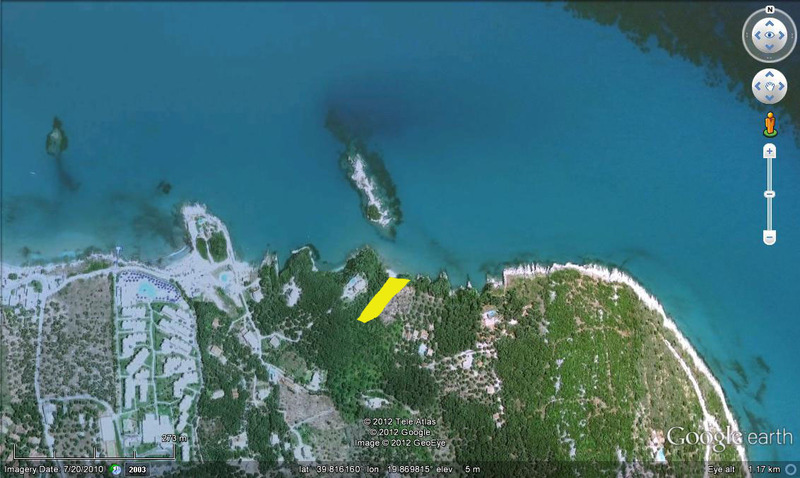 Are you intent on buying your own little slice of paradise on a beach in Corfu? If so, you’ll be pleased to know that the exchange rate is working in your favour lately, because the pound has strengthened to a 28-month high against the euro. Just recently for instance, Great British sterling hit its highest since July 23rd 2012, at 1.2867. What this means is that, when you whisk your money over to your Greek bank account to buy a Corfu property, you’ll now get far more euros. For instance, if you plan to transfer £125,000 to Greece, you’ll now receive +€17,000 more than if you’d done so 18 months ago, back when sterling was down and out at just 1.1371. So this is by no means pocket change we’re talking about here! With an extra +€17,000 in your Greek bank account, at absolutely no additional cost to you, you could do up your Corfu property, install a swimming pool, or just enjoy a quite substantial windfall! In any case, you’ll be far better off. In case you’d like to know, the pound is flying high versus the euro, because the UK’s economic outlook is so much brighter than the Eurozone’s. For instance, the IMF reckons that Britain will expand +3.0%, more than any other major economy, while the common currency bloc will be lucky to avoid a triple-dip recession. Hence, as the UK flourishes, so does sterling! With this in mind, you can now receive a far greater euro total when you buy a Corfu property, thanks to the strong pound. By Peter Lavelle at foreign exchange broker Pure FX. For free expert currency advice when you buy a Corfu property, call me on +44 (0) 1494 671800 or email peter.lavelle@purefx.co.uk. I’d be delighted to help. This entry was posted in Uncategorized on November 25, 2014 by Eric Cauchi. Corfu is one of the western islands of Greece (‘Heptanissa’, ‘Seven ‘Islands’) and is the northernmost large island of the Ionian sea. Its regional location (red pin) can be seen from the below map. Clicking on the map will open a larger version in a new tab in your browser. 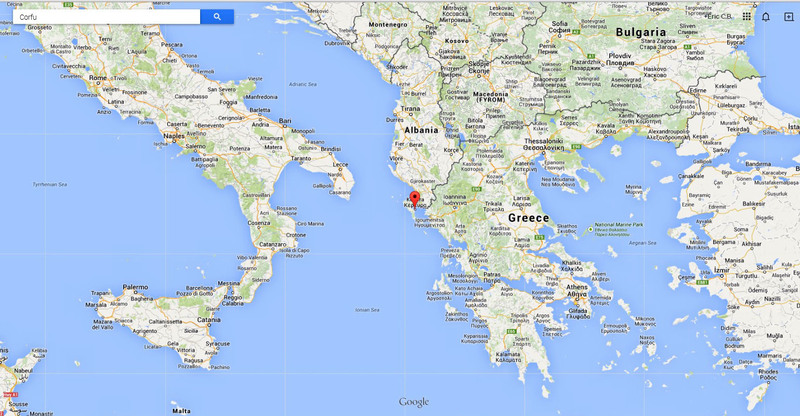 The plot is located on the northern coast of Corfu, 42 km (26 miles) from Corfu town and a few miles west of Kassiopi. 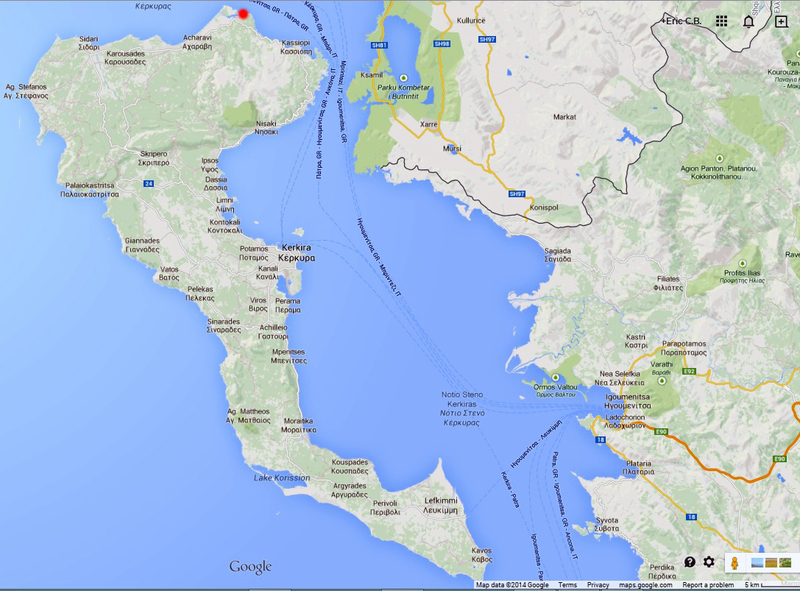 It affords a beautiful view of the sea and of Albania across the Straits of Corfu. All the above images are courtesy Google Inc (Google Maps and Google Earth). This entry was posted in Uncategorized on November 5, 2014 by Eric Cauchi.